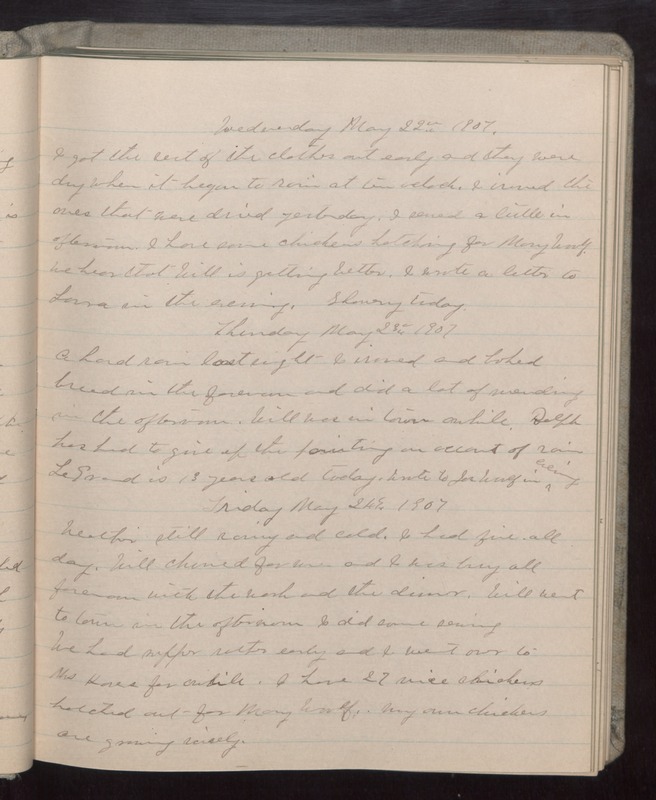 Wednesday May 22 1907 I got the rest of the clothes out early and they were dry when it began to rain at ten oclock. I ironed the ones that were dried yesterday. I sewed a little in afternoon. I have some chickens hatching for Mary Woolf. We hear that Will is getting better. I wrote a letter to Lorna in the evening. Showery today. Thursday may 23 1907 A hard rain last night. I ironed and baked bread in the forenoon and did a lot of mending in the afternoon. Will was in town awhile. Ralph has had to give up the painting on account of rain LeGrand is 13 years old today. Wrote to Joe Woolf in evening Friday may 24 1907 Weather still rainy and cold. I had fire all day. Will churned for me and I was busy all forenoon with the work and the dinner. Will went to town in the afternoon I did some sewing We had supper rather early and I went over to Mrs [Kovers?] for awhile. I have 27 nice chickens hatched out for Mary Woolf. My own chickens are growing nicely.